As we gradually recover from the housing crisis, extra caution must be taken to prevent future real estate bubbles. But merely detecting a bubble is a tricky and contentious matter. Earlier this week, Peter Wallison of the American Enterprise Institute warned that a new bubble is forming. His evidence? Home prices have increased more quickly than rental rates in the past year, according to data from the U.S Bureau of Labor Statistics and the Case-Shiller national home price index. This divergence should not occur under healthy market conditions, Wallison argues, because families should prefer to rent when home prices climb, bringing the costs of renting and owning back to equilibrium. The story is not that simple, though. A bubble is a situation in which instruments trade in high volumes at prices that are at odds with intrinsic value. A differential rate of increase between home prices and rents does not necessarily mean that the average mortgage payment, a more precise measure of the cost of homeownership, is growing faster than the cost of renting. While a mortgage payment does not capture all of the benefits of homeownership over renting, such as tax incentives and accrued wealth, it is a better estimate of the cost of owning a home than home prices alone. For example, when mortgage rates were high in the 1980s, the typical mortgage payment on a new loan was far higher than home prices alone would suggest. For a bubble to occur, the mortgage payment relative to rent must be historically high—a sign that families are continuing to purchase homes even though renting is more economical. To create a more accurate picture of whether a housing bubble is currently forming, we computed two ratios, illustrated below. The light blue line compares the home price index to the rent index, the relationship Wallison cites as evidence of a bubble. It depicts a large increase in the housing boom years, the subsequent drop, and a significant amount of volatility since 2009, including a slight uptick in the past two years. 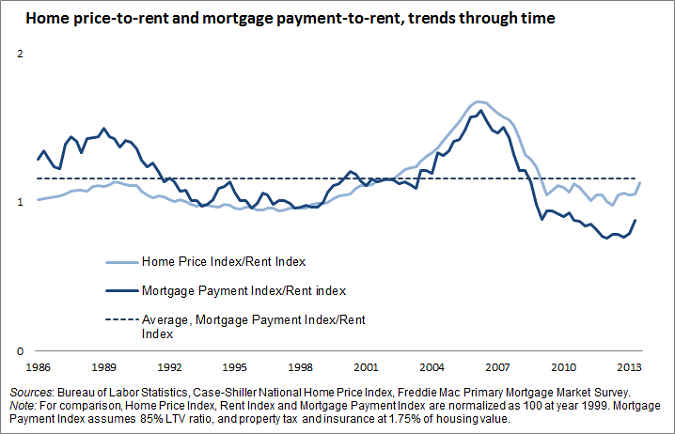 Evidence of a bubble becomes even less compelling when one looks at mortgage payments versus rent payments, represented by the solid dark blue line. The trend is similar, but the darker solid line remains far below its average (dotted dark blue line). This suggests that recent gains in housing prices are not indicative of a bubble, in which families continue to buy homes even though renting is more economical. Instead, we see a market that is somewhat skewed in the other direction—more economical for new owners than renters, compared to a typical period, largely because of low interest rates. What’s more, the housing bubble we just experienced was associated with easy access to credit, even for borrowers with low FICO scores, the standard credit score used in most lending decisions. The 10th percentile FICO score of all borrowers with new loans is a good representative of the lower bound of creditworthiness needed to attain a mortgage at any given time. December’s At A Glance, the Housing Finance Policy Center’s monthly chartbook, shows that this lower bound hovered near 600 between 2001 and 2006, but by 2013 had crossed 650, and it continues to rise. An increase of this magnitude means that the millions of borrowers who qualified for mortgages with credit scores below 650 during the boom years would struggle to be approved for a loan today. The increase is even sharper in some regions, such as the San Francisco and New York City metropolitan areas, where the average FICO score on new loans now exceeds 750. Credit availability today is far more limited than it was during the bubble years, and it is becoming more, not less, limited. In short, a historically high bar for creditworthiness and a below average ratio of mortgage payments to rents does not seem like a bubble. It is reflective of a tight credit box, low mortgage rates, and a gradual recovery in the housing market. The housing market will always go in cycles.